Nigerian troops have rescued 338 people from Boko Haram Islamists, local officials say. 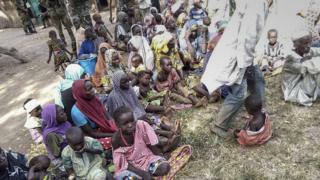 The captives, mostly women and children, were being held near the group's Sambisa forest stronghold in the north-east. They have since been moved to a camp for displaced people in Mubi, the army said. It is unclear if any of the 200 Chibok schoolgirls - also thought to be in the forest - were among those rescued. What next for the rescued? The raid took place on Tuesday and targeted "suspected Boko Haram terrorist camps at Bulajilin and Manawashe villages", the army said. Of those rescued, 192 were children and 138 were women. Troops also killed 30 suspected jihadists and seized arms and ammunition found in the area. Pictures released by the army following the seizure show mainly women, some carrying babies. Four suspected Boko Haram suicide bombers, apparently on a mission to Gubula town were also ambushed and killed by troops. Boko Haram sparked global outrage with the kidnap of the Chibok schoolgirls in April 2014. The Nigerian army has rescued hundreds of Boko Haram hostages, but none of the 219 kidnapped schoolgirls have been found.